Home » ALL ELSE » SW Captain’s Log – Yay. Pop-Culture Entertainment Hype! SW Captain’s Log – Yay. Pop-Culture Entertainment Hype! Some personal thoughts on the popular entertainment news coming out. Doctor Who (TV) – Huge fan since the 2005 revival. I am anxious for the new, recently announced 13th Doctor, portrayed by Jodie Whitaker. No longer a Time Lord, but a Time Lady (but still not ginger!). Such is exciting for this bold approach in casting, with its new showrunner (Chris Chibnall takes over after Steven Moffat). I did enjoy the last season and Peter Capaldi’s portrayal but felt much else was feeling tiresome and losing its originality. I have a good feeling the new direction and Doctor will freshen the franchise up. Game of Thrones (TV) – So, I hear from the new season starts tonight, and many are super excited. I have yet to watch the show, and perhaps I should start soon. Baby Driver (movie) – I recently watched Edgar Wright’s latest directed movie. It’s the best movie of the year so far. If disagree, please tell me of something better released in 2017, and I will check that out. Valerian and the City of a Thousand Planets (movie) – Still looking forward to seeing, even though the reviews are not hailing it as some perfect masterpiece. Star Wars: The Last Jedi (movie) – I like the new posters. But sadly, not feeling the excitement of the movie. Is there really much more of a story to tell here? What happens after the “Last Jedi?’ More “Wars?” I guess. As much as I enjoy space battles, I sometimes question what Star Wars is really about in the end. I hope this next movie will shed some light. Avengers: Infinity War Part 1 (movie) – Sure, I guess. It’s also another hype train boosted from the recent D23 convention. I’m sure there will be some awesome action scenes and campy moments, and probably some surprises. Such would be worthwhile if only the inclusion of the Fantastic Four and Silver Surfer would finally come about, and lead to a proper reboot of Marvel’s first family into the pop-culture mainstream. Star Wars: Battlefront II (game) – I must admit, I am far more interested in the Star Wars storyline of this video game. Here, is a completely fresh look at the pivotal original trilogy end, and what it means for those in the Empire serving. 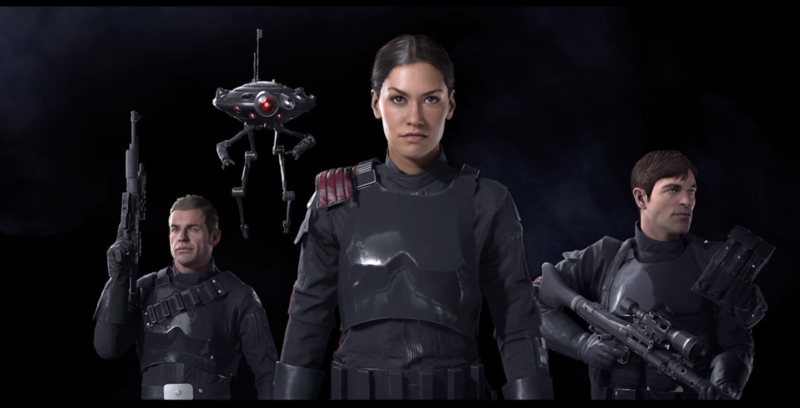 The introduction and details released in a recent video detailing the Inferno Squad, reveals a look from the Empire point of view seeing the Rebels as the villain. Such is a bold take that can go anywhere, with an interesting perspective on just what the Empire was looking to accomplish beyond the selfish power-hungry desires of Emporer Palpatine. The pride and personal relationships humanize the other side, towards an ideal I loved while watching the CGI Clone Wars animated series. I hope this will get released for the PC. Kingdom Hearts 3 (game) – It’s been about ten years since Kingdom Hearts 2, and a gazillion sub-sequels between. Is the hype still here? Not too much from me, as the gameplay presents much of the same thing, but with some new gimmicks and Toy Story now thrown in. I used to love the franchise, but this Disney/Square Enix collaboration must work harder to recapture some of that old magic. San Diego Comic Con (event) – The grand show of gathered fandoms is almost upon us, where I will be attending. I am super excited! But, I wish some much of the consumer hype could be about the comic books, because much there on shelves and in boxes are just as deserving of your attention as all the above franchises. I will be there checking out more on the sequential art and reporting back. “You have to be respectful of pop culture, because people interpret it in the way they want.” – Jaleel White. PICTURE: Star Wars: Battlefront II trailer video screenshot.